So, you decide that weight training is the best way to build he-man physique. You purchase some exercise equipment for the home and proceed to pump iron. Many guys who have started this way have gone on to make tremendous gains; others are continuously distracted and go nowhere. With television, cell phones, your personnel computer, and the family, it can become quite a challenge to have a great workout. Just lifting steel any old fashion is definitely not the best way to go. Besides wasting energy, you also run the risk of serious injury or worse. Rare and exotic workout routines often produce rare and exotic results, that is, if you consider pulled muscles, strained backs, hernias, and broken bones exotic. Try to keep your workouts basic and intense for maximum gains. The idea of joining a health club can be intimating to the beginner. After all, isn’t everyone going to be extraordinarily built and strong? Not necessarily, you see, most gyms are stocked with members trying to either lose unwanted body fat or add some muscle to their frame. Luckily, these days there are plenty of clubs from which to choose. Try to find one that is well equipped and staffed with professionally-certified instructors. Look around the gym and get a feel for its atmosphere. A good club will have an energetic vibe that is conducive to the progress of its members. Guys train with weights for lots of reasons. Today, before I ever begin to design a workout program for any of my new students, I first learn what kind of person I am dealing with. I learn about their athletic background, asking them if they have ever trained with weights before, and if so, what principles they used and for how long. I check to see if they ever participated in any sports such as gymnastics, football, swimming, etc. I ask them if they have a history of injuries, and I learn about their goals, as I try to find out just what they seek in our sport. In general, I try to educate myself on the person to which I will be offering training advice. Through my experience, learning about the type of person I am dealing with saves the both of us time and energy. As soon as I begin understanding my new student’s goals, I start to explain what natural bodybuilding is all about. I teach them about some of the basic benefits derived from our sport such as improved overall physique, increased physical strength, the ability to rid unwanted stress, added personal confidence, improved athletic capabilities, a better general appearance with a more positive outlook on life, and of course, (starting right with the first workout) a substantial increase in one’s health. After the novice begins to understand what natural bodybuilding is all about I then proceed to lay out an exercise program designed to meet his or her needs. There are almost as many different reasons for training as there are trainees. It is my job to see that my new student realizes maximum gains in the shortest time possible. Let’s see how this is done. First, let’s start with the beginners. The beginning period of bodybuilding can either make or break a new trainee. Through decades of experience, I have learned that most students have very little knowledge on how to weight train correctly. It is important to put the new student on a simple yet rewarding program. Putting them on a strenuous and complicated program would only ruin their chances of ever making it. By giving the beginners a schedule of exercises which emphasizes their “show muscles,” (abs, chest, and arms), their desire to continue with the workout program is greatly increased. A full body workout is the best way to train at the beginning of your bodybuilding career. Just be sure to have a realistic attitude and understand that a Mr. Universe physique does not come overnight. Unfortunately, the majority of guys cannot foresee this, which leads to their discouragement and lack of interest. Natural bodybuilding takes a lot of guts, determination, willpower, and years before one can ever realize their true potential. Getting the beginner to make it through all this is not exactly an easy task. It requires knowledge, experience, and good mentoring skills to take a beginner and turn him into a champion. I always start new students with a basic workout, training them three times a week, on alternate days. I start them with ten to twelve exercises, with emphasis mostly on the show muscles. On their first week of training, they perform only one set of each exercise. The second week has two sets, and finally, the third week has three sets per exercise. On all exercises, I time them to a one-minute rest period between sets. As they perform each exercise, I check their form, correcting any faults that may occur. I teach them the proper way to breathe, explaining the relationship between exercises and respiration. Moreover, I show them ways to help them achieve their gains faster, which results in an upswing of their motivation. In general, I am trying to get the novice off to a good start by increasing the possibilities of them making it through this first and most difficult stage. Bodybuilding is like climbing mountains. To reach your highest summit takes great perseverance and fortitude from deep within yourself. As you climb towards the mountains peak, you are bound to encounter obstacles and dangers that can derail your efforts. By using an intelligent and well-planned exercise program as your compass, you are guaranteed to climb the most awesome mountain imaginable, as your goals become reality. When you pass the beginning stage of bodybuilding, you should be proud that you made it through the most challenging stage and that you are ready to continue onward to the top of the mountain. As you become an intermediate bodybuilder, your enthusiasm should be burning stronger than ever since you have gained more knowledge on how to achieve your quest in the safest and shortest time possible. By applying this strong desire into your bodybuilding lifestyle, you are sure to succeed. It is important for the intermediate bodybuilder to plan his training into progressive stages. The last thing you want to do is follow a Mr. America style training program, because you would eventually burn out. You have to build your body’s recuperative powers up slowly, increasing the training intensity a little bit at a time. Natural bodybuilders are aware it takes years to become true champions. They also know that once they have achieved their goals, their gains are there to stay for decades. By applying this bit of sensible advice into your bodybuilding lifestyle, you can be assured of continued gains in the muscle you seek. Realizing that a championship body takes years to develop is a step in the right direction. Too many new trainees think that all they have to do is pop a few Big Ds and presto, instant Mr. Godzilla. It is a shame, because one day they are going to wake up and it is going to be too late. After decades of traveling down the anabolic highway the sport of bodybuilding has finally began to get back on the road towards health and longevity. It is up to you, the natural bodybuilder, to help guide others on this same path by setting an example for the masses to follow. Your presence on the physique stage, at the gym, and in your local community has a positive influence on others…use it and make a difference! I remember when I first reached the level of intermediate bodybuilder. My brother, Johnny, and I would train together three times a week on alternate days. We would follow a schedule of exercises emphasizing the basic movements. Every exercise we performed was a tremendous effort. There was no letting up. We used the heaviest poundage possible on every exercise we performed and made sure to keep the movement strict during the first few reps, adding a slight cheat towards the end of the set. We trained so hard that after every workout we would just collapse and rest for about twenty minutes. Our efforts and dedication paid off. Within six months of intense training, our gains were so miraculous that relatives and friends who had not seen us in a while became astounded when they laid their eyes upon us. We had transformed ourselves into extremely well developed natural athletes. It was hard to believe that only a few months earlier our bodyweights were nearly twenty pounds lighter and now, here we were, with muscles popping out in places that we did not know existed. While working out three times a week is a great way to train, chances are that sooner or later you are going to move on to a split system. By applying the split system’s principles to your bodybuilding training, you will be able to devote more time and energy to each body part. Just remember not to go overboard by adding twenty different exercises per muscle group. Instead, try keeping it around three with a movement for each part of the muscle group. For example, the deltoids are composed of three different muscle-heads: frontal, lateral, and posterior sections. Together they make up the entire deltoid region. Now at this stage of the game it would be foolish to concentrate on just one section. Let’s say you’re training the shoulders. Instead of performing the Behind Neck Shoulder Press, Military Press, and Alternate Dumbbell Press, which concentrate mainly on the frontal deltoid, you’d be better off performing the Behind Neck Shoulder Press, Standing Side Lateral Raise, and Bent Over Lateral, which work all three heads of the deltoid region, giving you a more complete and squared off look. By applying this basic idea to your exercise schedule, you will save yourself a lot of time and energy by not having to balance out your physique’s symmetry later on. In addition, you will have a better understanding of your body’s proportion, shape, weak, and strong points. Now, there are many different variations of the split routine. When advancing from training three times a week to the split system, I usually suggest breaking the body parts up into two separate routines, training a total of four times per week. If you have a year or more of steady training, and your goal is to pack on slabs of muscle and gain loads of strength, then four weekly workouts is for you. For example, on Monday and Thursday, you could train your chest, back, and shoulder groups, and on Tuesday and Friday, you could devote your energy to bombing your thighs, calves, arms, and abdominals. Many of my students do well with this type of training system. The body easily accepts the transition from three workouts per week to four. As a matter of fact, a good deal of my students usually go on to add a fifth training day by performing some light work on their weaker body parts. Throughout my decades in the gym, I have occasionally incorporated supersets into my routines with great success. I find that supersets help stimulate my muscles by gorging them with blood, thus giving me a super pump. The difference between a superset and a normal set is that a superset consist of two or more exercises and is performed with little to no rest between sets, whereas you may rest several minutes between individual sets. Personally, I find that supersets are excellent for developing definition but are not effective for building mass or strength. They are not effective because of the reduction in the level of resistance that is used. This reduction in poundage is caused by fatigue due to the lack of recovery time between sets, which results in the decreased level of potential mass to be gained. Supersets save time by reducing the rest interval between two exercises. Shortening the rest period between sets increases the intensity because you are overloading the muscles being trained by performing more work in less time. 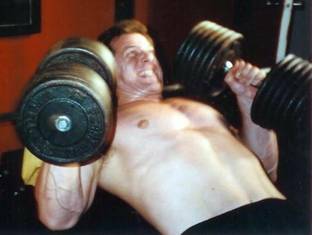 One of the disadvantages of supersets is that several pieces of equipment are required. This means that a bodybuilder has to prepare his free-weights and machines before he begins his planned movements, and hope that nobody gets in his way during the superset. Having an alert workout partner should keep things in order. Another training principle that I have used on a rare occasion is the Forced Reps Principle. This is one of the most popular and without question the most abused intensity technique. A spotter is needed to provide enough assistance for the trainee to be able to complete the repetition. The purpose of forced reps is to help the trainee realize greater gains in muscle mass and strength by extending the set past the point of failure. With forced reps, a training partner should assist just enough for the trainee to grind out the last rep past the point of failure. The abuse with forced reps comes when the trainee relies on the spotter for assistance during most of the set. In my opinion, forced reps should only be used on the last rep of an exercise to help induce further gains. Properly executed, forced reps are very demanding and can severely tax your recovery systems. Since they can easily tear muscle tissue, use them very sparingly and with great caution. The question of how many repetitions are required to build quality muscle mass has been debated for decades. Some bodybuilders respond well to low reps with heavy poundage, while others enjoy the results that higher repetitions bring to their physiques. Both ranges of repetitions have been demonstrated to work effectively in adding new muscle. In general, the amount of repetitions you should perform on any given set usually depends on your body type and goals. After training for several decades, I’ve learned that my body responds best to a low to medium rep scheme, which for me is between three and ten reps. After warming up with a light set or two of high reps, I usually perform my heavy sets in the range of five to six repetitions. On exercises such as the Full Squat, Parallel Dip, and Deadlift, I gradually add weight through the sets until I have reached a peak of one to three heavy repetitions. I like the way the heavy weights feel and enjoy the big gains they bring to both my physique as well as my strength. Remember, when training heavy it is important to warm up by gradually pyramiding the poundage from a light weight to heavier poundage in order to prevent the risk of serious injury. When teaching beginners how to train, I combine high repetitions (twelve or more) with light weights so the new trainees learn how to perform the exercises prescribed in a proper and complete form. The trainees find that this combination puts little strain on the actual muscles being worked, and helps to ensure that they will continue with their bodybuilding ambitions. Although the higher repetitions provide less resistance than the heavier steel, they do build more endurance than the lower range of repetitions. The higher repetitions also tend to pump more blood into the muscles and help add new growth to the body part being trained. If you have a muscle group that does not respond well to a low/moderate repetition scheme, performing higher repetitions may be what is needed to shock that stubborn area into new levels of growth. This has been another hot bed of discussion since the late 1970s, when Arnold Schwarzenegger, who is a proponent of high volume training, debated training concepts with former Mr. America, Mike Mentzer, who presented an impressive argument for high intensity vs. high volume training. When in high school, I purchased several training booklets from Arnold, which detailed the training concepts that made him the greatest bodybuilder in the world at the time. Arnold loved high volume training. In his booklet on building the pectoral region, he described how he believed performing fifteen sets of the Barbell Bench Press during his chest workouts was responsible for creating the world’s most famous pectoral region. In fact, many bodybuilders from the sport’s Iron Age trained with high volume workouts, sometimes performing as many as twenty, thirty, or more sets per muscle group. When the educated and well-spoken Mike Mentzer came along, he rocked conventional thought. 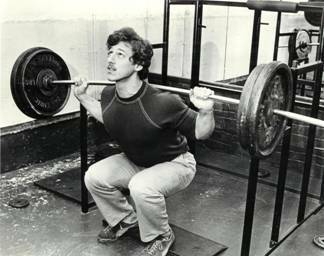 Mentzer believed that training intensity, not volume, was responsible for his championship form. In his younger years, he had built a championship physique through high volume training. However, he believed bodybuilders could make similar if not better gains through a training concept he coined, “Heavy Duty.” Mentzer believed bodybuilders could train hard or they could train long, but could not do both. He equated a bodybuilder trying to perform high volume with high intensity to a runner trying to sprint a marathon. In his opinion, it was impossible to do both. Personally, I believe the answer lies somewhere in between volume and intensity. In my many decades of pumping the steel I have tried just about every system and theory associated with weight training. I have learned that several sets with low to moderate repetitions for each exercise, works best for me. Not counting warm up sets, I feel that three hard sets are sufficient per exercise, with a total of ten to twelve sets per muscle group. The trick is to perform the right amount of muscle stimulation without overtraining and wasting the workout. Too many exercises, sets, and reps will only hamper your ability to recover from your grueling workouts. Through many decades of training at various gyms, the one mistake that I have repeatedly witnessed by bodybuilders is that they continuously overwork the muscles that they are trying to grow. Unfortunately, this only leads to fatigue, decreased strength, loss of muscle mass, and an increased heart rate, with little desire to return to the gym. When searching for your training threshold, gradually increase your workload to meet your body’s recuperative powers. Be patient. It will take some trial and error to find your training limit, but once you do, you will be better able to navigate your training towards greater gains without having to worry about the negative effects caused by overtraining. Bodybuilding is an endless pursuit! It takes years of commitment, desire, effort, and guts to pump muscle with steel so that we may realize our goals in this world of muscle and strength. Unfortunately, the journey to Muscledom is filled with roadblocks that can sometimes derail a bodybuilder and put him on the disabled list. This sport of ours requires pushing, pulling, and straining against heavy metal. It demands our constant attention and focus in the gym, and punishes us when our thoughts wane or our technique becomes sloppy. Over the decades, I have witnessed as well as personally experienced many different types of physical injuries. To make lasting gains in the gym I like to train heavy and with great intensity. While I find this type of training is best to stimulate growth it also brings me into the danger zone as I continually flirt with the chance of experiencing a serious injury. Workout after workout, bodybuilders push their physiques to the max, and unfortunately, they sometimes suffer from some sort of injury as a result. Whether it is a tear in their flesh or a bone snapping from the stress placed on it, bodybuilders are often reminded of their human limits. Injuries are a common problem in all forms of athletic endeavor but are even more prevalent in the bodybuilding community. Gyms, by themselves, are inherently dangerous places to be without adding the careless factor into it. To last in this iron game you need to have common sense in the gym and learn how to avoid injuries before they happen. Having the thick head that I do, I learned the hard way a long time ago. After experiencing several serious injuries, something registered in my old cerebrum and advised me to smarten up before I became permanently disabled. Today, I listen to my body’s feedback and make the appropriate changes in my training when warranted, so that I may avoid any potential injury. In the gym, I have witnessed plenty of torn biceps, muscle spasms, and ruptured disks caused to bodybuilders. This is mostly due to the physical and psychological stress muscle builders place on their bodies through the heavy resistance they use. Whether you are new to the iron game or have decades of intense training under your lifting belt, you need to pay particular attention to any warning signs your body may be giving you. If you ignore a warning, you will undoubtedly pay for your carelessness with pain and forced time away from the gym. Bodybuilders experience injuries because of poor exercise technique and lack of focus. Incorrect exercise form can pull, rip, spasm, and tear muscle and delicate connective tissue. Our bodies and limbs have very specific biomechanical pathways and muscle builders need to be precise when it comes to performing each exercise with the proper technique. To prevent serious debilitating injuries it is imperative for bodybuilders not to deviate, twist, or misalign their bodies while lifting heavy weights. I always find it amazing at how many trainees cause injury to themselves because they fail to use caution during their workouts. To avoid injuries in the gym I handle weights that I know I can handle in a safe, correct form, and through a full range of motion. To me, it is just common sense. Here are a few of the things to avoid while climbing the mountain. Probably, the biggest reason for injuries in the gym is when trainees try to lift more weight than they could possibly handle correctly. When it comes to using too much weight, I can write volumes on this. We are all guilty of pushing beyond our normal limits and I am no exception. I have crashed to the floor plenty of times when squatting heavy and have had more mishaps than I care to remember. However, if there is one exercise that trainees love to push more weight than they can handle, it is the Bench Press. Don’t ask me why, but the Bench Press has become the standard in the gym by which we measure our strength. In the old days, when someone asked how much you could lift, he or she was referring to the Military Press. This lift has been replaced by the Bench Press, which in my mind is an inferior upper body movement when compared to the Parallel Dip. Using too much iron in any exercise is a sure way to experience a serious injury. If you cannot control the poundage you are lifting within its biomechanical boundaries and if you have to jerk the weight in order to lift it, then that is a good indication that you are using more weight than you could handle. Personally, I rarely use spotters. Nevertheless, if you have been training for a year or so you might want the benefit a spotter can bring to your workouts. Spotters are of particular benefit when maxing out on power-lifts such as the Bench Press and Squat. Many bodybuilders have seriously been injured while performing these movements and having a spotter by your side is one way to avoid injury. Make sure the person spotting you is strong and focused on what you are doing. The last thing you want is for him to be checking out some fitness babe while you are attempting a new, personal record. The Cheating Principle allows muscle builders to train beyond their normal capacity and therefore should only be used by advanced lifters. This principle takes the muscle beyond its point of failure and can literally force it to grow. I like to use cheating movements to further my gains. Being a bodybuilder that likes to train heavy, I incorporate the cheating principle quite a bit into my training, but as I perform an exercise, I am sure to feel the resistance constantly in the muscle desired as I move the weight in the line of the exercise. When applying this principle to your training, make sure not to overdo it as so many trainees do. You must feel the weight in the muscle being worked. For example, when performing the Cheating Curl movement you should feel the biceps receiving stimulation throughout the entire exercise. If your back starts to spasm, it’s probably a good indication that you’re handling an excessive amount of steel. Overtraining drains the bodybuilder’s energy and retards his progress in the gym. It is virtually impossible for the bodybuilder to make gains when in an over-trained state. Overtraining interferes with both the muscle and the nervous system’s ability to recuperate because it severely depletes our body’s glycogen stores and puts our metabolism in an unsettled state. We have all over-trained at one time or another. When I’m at the gym and have some extra time, I like to keep lifting the steel until the gym closes for the night. Sometimes this can be up to four hours of heavy bombing, which definitely falls into the category of overtraining. Have your basic workout planned before you enter the gym and when you are finished, put the barbell back on the rack and leave. Use your time wisely. Another neglected factor in the gym is priming the muscle area to be trained. I remember Bill Pearl’s words in an article he wrote about warming up. Simply put, Mr. Pearl stated that if you did not have the time to warm up, then you did not have the time to train. Makes sense to me. Think of it as getting in your car on a cold winter morning. You wouldn’t just start the car and speed off…would you? If you had any kind of sense you would let the engine run a while as it primed its pistons for the road ahead. The same rule applies to weight training. If we neglect to prime our muscles before we lift the heavy stuff we are definitely going to breakdown our motors and crash before we get on the highway. A warm up is usually a high rep, low intensity, quick-paced exercise, or two, used to increase blood flow to the muscles. Performing a few light movements raises the temperature of the involved muscle, while decreasing blood viscosity and promoting flexibility and mobility. This is because a muscle with blood coursing through it is more elastic and pliable than a cold, stiff muscle. 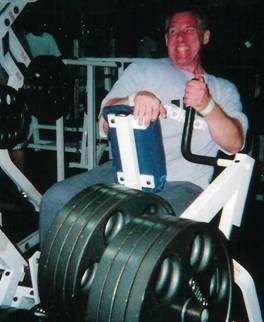 When I begin my workouts I start slowly, using very light weights, and increase the poundage with each set I perform. I am especially sure to warm up on every power movement I perform. For example, I usually perform the Barbell Squat in the middle of my thigh routine. Now, even though my thighs are burning by the time I get to the squats, I am still sure to start the exercise with a very light weight and get my form in a correct line before I increase the poundage. Warming up is necessary for a safe journey. In addition to warming up with light weights, I also perform several stretching movements before and during my workout to prevent injuries. I not only stretch the muscle group to be trained, but the entire body as well. When stretching, I bring a joint to the end of its range of motion and hold it there for a period. As I feel my muscles relax and elongate I am careful not to bounce them, since this could result in an injury. You should perform your stretching exercises in not only the gym but also whenever you have a few spare moments. Stretching can be done anywhere and at anytime. Incorporated with your weight training, stretching helps loosen the muscles and make them more neurologically alert, thus helping them to become more pliable and injury resistant. Stretching between sets also helps to build muscle by promoting muscular circulation and increasing the elasticity of the fascia. An important point to remember is that flexibility is joint specific. Some joints can be more or less flexible than average. Flexibility in a joint depends upon the joint surface, the length and elasticity of ligaments, and the elasticity of muscles. Flexibility can be improved upon by anyone and at any age. If you stretch regularly and correctly, it can be tremendously beneficial. Stretching allows for maximum muscle repair and decreases soreness resulting from exertion. Most importantly, stretching regularly can help you prevent injuries. Good forms of stretching are tai chi, yoga, pilates, and some callisthenic exercises. Negative Reps is another training principle that can cause muscle builders painful injury. I find that negative reps are one of the most difficult and dangerous of all weight-training principles. This is because the amount of resistance used is overloading the muscle that is being trained. When bodybuilders train, they normally use weights that they are capable of moving in a positive motion. When negative (eccentric) movements are incorporated into the workout, heavier resistance is needed. To train in this manner you need an experienced spotter or a machine designed to move the poundage from you in a concentric motion. Keeping your mind focused on what you are doing in the gym can prevent disaster. The easiest way to hurt yourself, or someone else, is not to pay attention to what you are doing. Years ago, while getting some 45lb weight plates off the plate-rack, I accidentally dropped one on my foot and instantly felt an intense pain that sent me soaring. Now, I did not drop the weight because it was too heavy, I dropped it because my mind was elsewhere and not focused on the task. The same applies to your training. When in the gym, watch the advanced bodybuilders and see how focused they are in their training. It is this kind of intense focus that helps prevent them from experiencing injuries. Their minds are in tune with their muscles. Once you acquire this same ability to focus, you too will enjoy years of injury-free training. One ounce of prevention is worth more than a pound of cure! When it comes to training accessories I have never had the need for knee-wraps or a lifting belt, but I have used training gloves and do use wrist-wraps on rare occasion to aid in my grip when pulling very heavy steel. Using knee-wraps during heavy squats may help to protect your knee joints. They do this by helping to increase external pressure and by distributing the strain across a larger area. Similarly, a lifting belt acts like a layer of muscle across your lower back as it distributes the strain of the weight away from your lower lumber area and into the belt itself. Bodybuilders find wrist-wraps useful during heavy lifts such as the Deadlift, Shrug, and Row. Wrist-wraps not only help prevent the lifters from dropping the heavy steel, but also allow them to lift heavier because they are attached to the bar and don’t have to worry as much about their grip. Earlier in my bodybuilding career, I experienced a tremendous amount of callus buildup on my hands. I was training several times a day and the calluses were very thick and covered my entire palm as well as my five fingers. I bought a set of weight training gloves and they seemed to help a bit with the callus problem. However, because of my intense lifting, the gloves kept tearing apart. Finally, after a dozen or so pairs I decided to call it a day and just train bare handed. A. For serious injuries seek medical attention immediately. Postponing the inevitable will only delay recovery time. B. If the injury is to a bone or joint, protect the area by supporting it with a brace or splint. C. Give the injury plenty of time to heal. Minor injuries should resolve themselves within several days. Serious injuries may take weeks. D. Treat the injury with ice or cold packs to help limit inflammation, swelling, and internal blood loss. E. Use a wrap or towel as a compression on the injured area to limit swelling. F. Elevate the injured area above the level of your heart to reduce blood flow to the area and to help decrease blood loss and swelling. If performing an exercise causes injury or exasperates a condition, stop immediately! Give your body time to rest so the injury can properly heal. I have been knocked down plenty of times during my many decades in the gym. The one thing that I have learned, is that when you experience an injury in the gym, stop training. Missing an exercise, workout, or even a week or two from the gym, is better than turning a minor problem into a major one. Train for gains not strains. It is a great thing to lift mountains of steel as long as you do not fall and crash along the way. Know your limits! Be patient and give your body time to develop its maximum strength potential. When training with heavy steel be sure to have someone spotting you as a safety precaution. A good way to help guarantee steady gains with your training is to have a workout partner who is motivated and willing to push to the limit. Having someone there when you need to force out an extra rep or two is a great and safe way towards continued progress. Train with a partner who’s at the same stage of development and strength as you and who will be there to motivate you on days when you are down in the dumps. Have you ever noticed that guys with he-man size physiques tend to get some extra respect wherever they go? Make no mistake about it, size matters, and the bigger you are the more you’re going to standout. Once you reach he-man proportions, you may be surprised to notice that people who were a bit unkind to you in the past have now become downright friendly. Now on the other hand, nothing turns a woman off more than an egomaniac who is full of himself. Learn to act in a low-key fashion while in the public view, and take an interest in what others have to say. The bigger and stronger you become the more essential it will be to develop a friendly personality. It’s just not all about you, and the sooner that sinks into your muscle-man brain the better off we’ll all be. While being dedicated to your bodybuilding is great, don’t forget to enjoy the simple pleasures in life. Every once in a while take some time out from your training and experience the world around you. When on vacation forget about the steel and take a hike, swim, or just relax and take it all in. Advanced bodybuilders are like living works of art. Wherever they go, they bring their creation with them. Some guys like to display their masterpieces every chance they get. Men with muscle cars don’t race them at every corner they turn; the same principle applies to you, save it for the competition. Bodybuilding is an extremely scientific sport. By attaining as much knowledge as you can on the subject, you will not only realize your goals sooner, but also understand how you got there. Make it a habit to buy and read as much literature on the subject of physical culture as possible. Evaluate what you learn and apply what works best for you and your natural bodybuilding lifestyle.